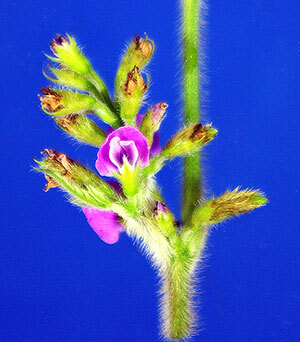 Figure 1: Open soybean flower. There are only two yield components for grain crops: number of seeds and average seed weight (seed size). Although seed size has been a recently popular topic for discussion, seed number is the more important of the two yield components. So, understanding how plants regulate seed number and how this yield component responds to stresses and crop management are helpful in understanding soybean yield production. 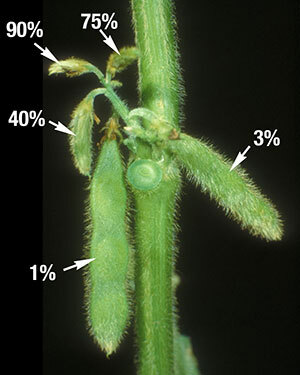 Soybean seed number is determined by the number of flowers produced, the number of pods retained on the plant, and the number of seeds per pod. Because flowers can be produced on all stem and branch nodes, flower number is highly influenced by the amount of branching. The number of branches and branch length are amazingly flexible and respond to stand density and plant spacing. In this article I want to focus the discussion on the number of pods retained. Unlike corn, soybean plants produce “complete flowers”. Complete means that they contain all four basic flower parts: sepals, petals, stamens, and pistil (Figure 1). Soybean flower structure ensures that they are highly self pollinated. The two keel petals enclose the sexual parts making it nearly impossible for wind or insects to carry pollen into flower (Figure 2). 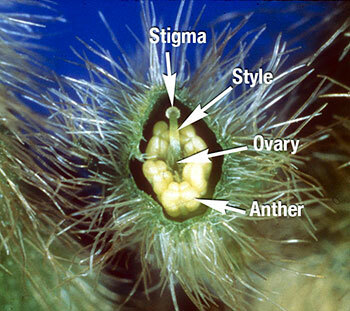 The 10 stamens (male parts) are closely situated near the pistil (female structure) so that pollen grains produced in the anthers (part of stamen) are deposited directly onto the stigma (part of pistil) (Figure 3). More than 98% of soybean pods result from self pollination. Figure 2: Unopened soybean flower with sepals removed; petals cover sexual parts. 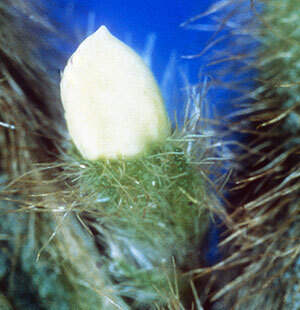 Figure 3: Soybean flower sexual parts; picture of an immature flower so stamens have not fully elongated. Shortly after pollen grains land on the stigma, pollen tubes emerge from the pollen grains and penetrate the stigma. Pollen tubes elongate through the short style. The style tissue provides nourishment and water to the growing pollen tube. It also provides direction, so that the pollen tube’s journey ends in the correct place - inside the ovary. Each ovary contains two to four ovules. The ovary wall will become the pod wall and the ovules will become seeds. 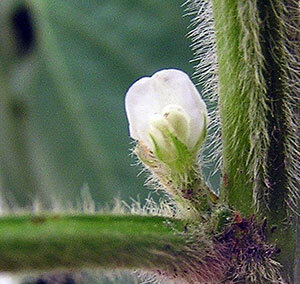 As with all agronomic plants, soybean flowers undergo double fertilization. Three nuclei (plural of nucleus) move into the pollen tube. One of the three nuclei directs pollen tube growth and will not be involved in fertilization. The other two nuclei travel down the pollen tube and enter into the ovule once the pollen tube completes its journey. One male nucleus combines with the female gamete to form the embryo within the seed. The other male gamete joins with two female nuclei to form the endosperm. Mature soybean seeds contain almost no endosperm. The large cotyledons accomplish the food storage function usually associated with endosperm. Each ovule in an ovary requires a separate pollen tube for fertilization. If an ovary contains three ovules, at least three pollen tubes must enter the ovary if all three ovules are to be fertilized. For corn, the number of female flowers that become fertilized is an important determinant of seed number, and that number is highly influenced by weather. Fertilization of soybean flowers is nearly 100%. Reasons for high success rate are: many pollen grains are produced in the 10 stamens; no pollen grains are lost by wind, weather has little effect on maturity sync of stamens and pistil, pollen tubes must travel a short distance from stigma to ovary; and the flower petals cover the pistil, which reduces dehydration. Soybean plants bear flowers on inflorescences called racemes. Racemes have multiple flowers attached by a short stalk (pedicel) to a central, unbranched axis (rachis). After flowers are fertilized, the rachis elongates and separates the developing pods (Figure 4). Flowers in a raceme are fertilized in a specific pattern starting with the flower nearest the plant and proceeding up the rachis to the last flower. It may take 4 to 10 days for all flowers to open on a single raceme. There are three buds at each leaf axil that can produce racemes, so flowers may continue to open at a node for two or more weeks (Figure 5). Figure 6: Effect of position within soybean canopy on flower abscission probability. Node 1 is closest to soil surface. Soybean plants produce two to three times more flowers than there will be pods at harvest. This excess capacity is part of a strategy to produce viable seeds even if stress causes flowers to abscise. Abscission is an important process that controls pod load (and seed number) on soybean plants. Poor growth conditions including drought stress, shading by weeds, leaf defoliation and even long periods of clouds increase the amount of abscission. But, even under excellent growing conditions, abscission of 50% or more of the flowers is normal. 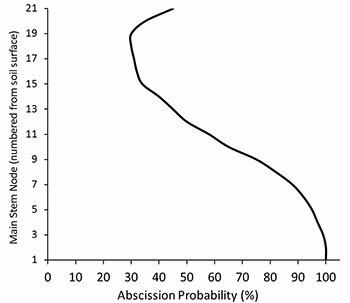 Figure 7: Abscission probability of flowers/pods within a raceme. Picture is from Iowa State University. As stated before, nearly 100% of soybean flowers are fertilized. So, technically all of the reproductive structures that abscise are pods. But, many of the structures that abscise are very small pods that may have petals still attached. Not all flowers have an equal chance of remaining on the plant. 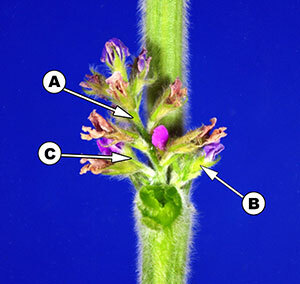 Flowers produced on nodes near the bottom of the canopy are more likely to abscise than flowers located in the upper one-third (Figure 6). Abscission probability also varies among positions on a raceme. The ages of pods at position 1 (oldest) and position 5 (youngest) on the raceme in figure 7 differ by only 4 to 6 days. But, the sizes of the pods differ greatly. The pods at the first two positions are closer to the source of sugars and other nutrients. They are well nourished and dominate pods at other positions. Development of pods at position 4 and greater is often arrested so that they grow slowly or not at all. Under normal weather conditions, abscission probability is less than 5% for pods at positions 1 and 2 and 75% or greater for pods at position 4 and above (figure 7). Young pods located at upper positions on racemes develop into harvestable pods only if stresses damage pods at lower positions or caused them to abscise.